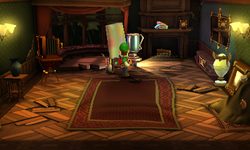 The Studio is a room in the Gloomy Manor in Luigi's Mansion: Dark Moon. This area can be accessed by going through the upper left door in the Common Hall or by dropping through the fireplace via the Study. The Studio has a canvas with a picture of a Hider on it. There are several vases and a fireplace in the room. A large camera is in the room, which the player can look through. During A-2: Gear Up, Luigi needs to access the Studio by using the secret passage via the Study. Inside the Studio, Luigi will need to fight two Hiders and one of the Slammers that took a gear from the mechanism in the Foyer. If the player replays A-3: Quiet Please after obtaining the Dark-Light Device, they can find a Boo here by shining the Dark-Light on the missing canvas. In A-5: Sticky Situation, the Studio might be one of the rooms covered in spider webs. Starting from A-2: Gear Up and all subsequent missions after, the player can look into the camera to see an amethyst stuck inside a spider web behind the drapes.